Our comprehensive set includes algae usually featured in college textbooks. The 25 cultures include Anabaena, Bactrachospermum, Bangia, Chlamydomonas, Chlorella, Dictyota, Ectocarpus, Euglena, Fischerella, Gloeocapsa, Gleotrichia, Micrasterias, Netrium, Oedogonium, Oscillatoria, Peridinium, Scenedesmus, Spirogyra, Spirulina, Nitzschia, Synura, Ulothrix, Ulva, Vaucheria, and Volvox. 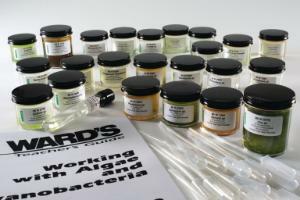 The set also comes with the Working with Algae manual and materials for 35 students.